Cristina Aldrete, the seasoned NSACC Executive Vice-President of Government Affairs will become the Chamber’s new President and CEO, effective August 1, 2018. Aldrete succeeds Duane Wilson, who for the past 25 years built the NSACC into one of the state’s leading business and advocacy organizations. Aldrete, who began her career at the NSACC in 2015, learned she had made it to the final round of CEO interviews last week and was happy to accept the position. “I am thrilled beyond belief to accept the leadership of the Chamber. I am also acutely aware of Duane’s legacy of leadership and the importance of his management discipline that I am committed to continue, even as we explore new ways to build our pro-business stance in the community,” stressed Aldrete. Chambers of commerce have long played a ceremonial role as ambassadors of goodwill, representing cities, communities, and businesses—both established and new. Aldrete acknowledges the growing importance of legislative advocacy as a “primary function” of chambers competing to develop and grow a base of members. “We’re also a business, and a critical focus for me, in addition to day-to-day management, is to build membership and engage those members in a full range of activity that promotes our mission,” Aldrete declared. 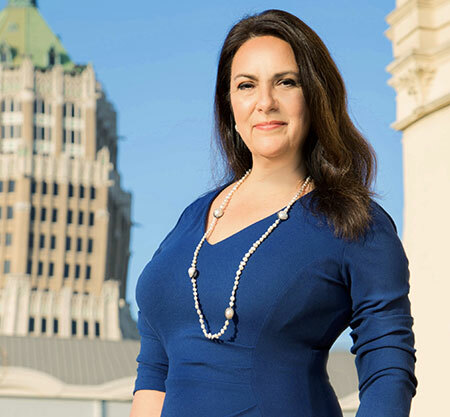 Aldrete promises the North SA Chamber’s mission – to strengthen Member-businesses, and the community, through the delivery of legislative advocacy, leadership development, and business-to-business marketing and recognition – is also her mission.